Today, I sat with two staffers and determined a goal: we will publish new content daily. If any of you were like me, confused and discouraged about combining a print publication with a web publication, take heart. For the first time in several years, I have faith that my staff’s news website (on SNO) and its print edition will both survive in combination with each other. In the past, my newspaper production staff has always abandoned any original web stories when it began producing its print content. Now, I have a web editor. The web editor’s only job is to manage the news site. At the juncture in the print schedule in which the print publication had page editors working on layout and design (after the stories were brainstormed, storyboarded, and written for the print publication), the web staff began its adventure. Anyone who wasn’t working on layout and design for the print publication was enlisted to work on the website. What were our ideas? 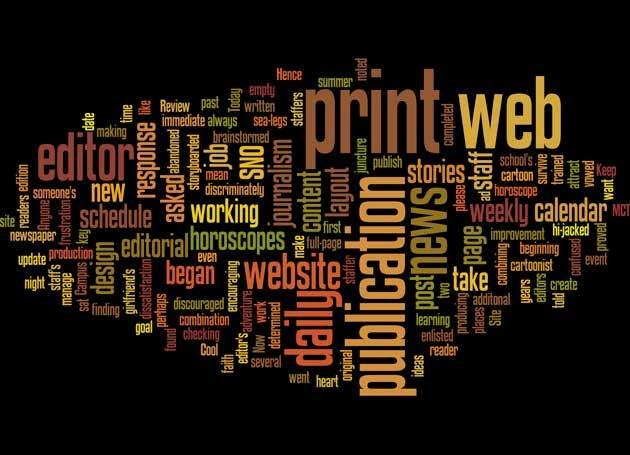 A new staffer who didn’t take beginning journalism and is finding her journalism sea-legs was asked, “If you were a reader of horoscopes, would you want them weekly or daily?” Her immediate response proved that a daily horoscope would please and attract readers most. Hence, she will be trained to post and schedule the daily horoscopes from MCT Campus. The A&E editor, whose page was hi-jacked by a full-page ad, told me about his girlfriend’s dissatisfaction with the school’s event calendar and her additonal frustration when she went to the news website and found it empty. He vowed to update the calendar (perhaps even making it a date night). As we were learning how to post more discriminately, my news editor was checking off places of improvement noted on our SNO Site Review. Keep encouraging, but the key is to make it someone’s job to be web editor.